I love cleaning and restoring Amtico, Karndean and other luxury vinyl tiles. They only make up a small amount of the cleaning works I carry out, but they can be the most satisfying. These floors come in all different styles, and the main brands do come with a long guarantee. It is important however to care for these floors as they are not a magical solution to your flooring woes. Here is the floor before I started the process. And now after the Dirtbusters clean. Why was the floor so dirty? The problem here was the excessive use over the years of Amtico floor dressings. The client loves the way the floor looks once clean and dressed, but too many coats on a not clean floor had given the floor a really ‘off’ appearance. The walkways had lost this bad dressing and were showing the non-dressed floor beneath. 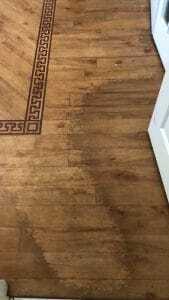 How did I clean this Amtico? Look at this picture. It shows the old dressings and dirt that had become stuck to the floor in places and worn in others. To clean this I had to use the Dirtbusters hard floor cleaning machine, along with a strong cleaner and floor stripping pads. My floor cleaning apparatus vibrates, so it’s not a messy affair. 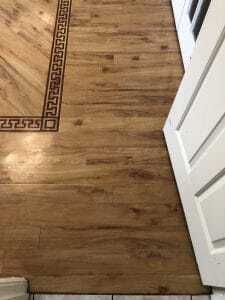 Although the old seals were removed easily enough in the dining room (see pictures at the start of post), the hallway as seen here was a different kettle of fish. But, with a little patience and with the correct choice of cleaning agents I stripped it all back so the floor was bare, just like the day it was laid. 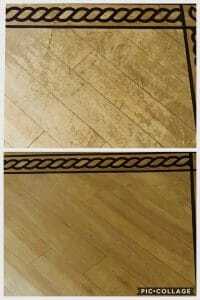 Once these types of floors have been restoratively cleaned, I always apply a dressing – customers choice of satin or gloss. Once applied and dry (usually around 25 minutes) I will usually apply a second coat. Customers that go with the gloss option are always amazed as to just how glossy the floor has become. This dressing helps protect the floor for future use. Need hard floor cleaning in Warrington?